The Elaine, it’s plain, is for sale in the main. 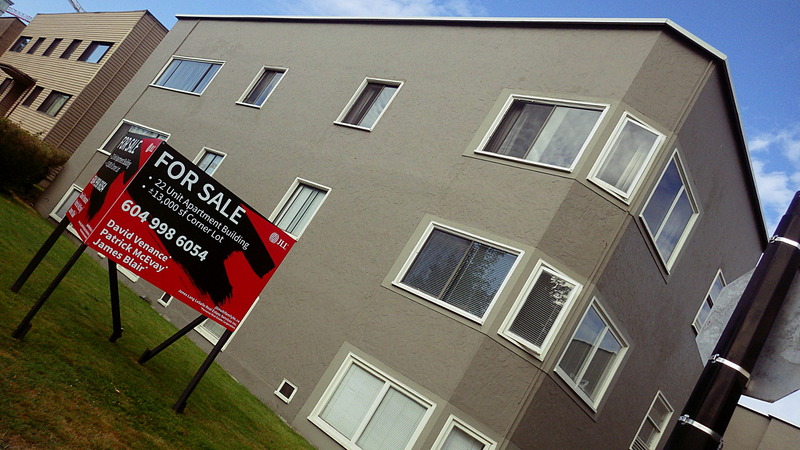 The Elaine Apartments, a three-storey, stucco walk-up, located at 3819 and 3821 Cambie Street, which has occupied the truncated southwest corner of Cambie Street and 22nd Avenue for 72 years, is up for sale, after a fashion. The red and black sign staked in the front lawn says “For Sale” but it does not list anything like a price for what it describes as a 22-unit apartment building on a 13,000 square foot corner lot. But I was told on Wednesday (July 13), by the Elaine’s retired live-in caretaker, who still like to putter around the property, that the owners are asking around $5 million. The Cambie Street address of the Elaine is either 3821 or 3819, depending which entrance on 22nd Avenue you use. Five million is quite low for a building with a current total property assessment (land and improvement) of $7,454,000. But—said the former manager—only half of the building is actually being sold. He explained that the owners are two business partners and that the sale is of one partner’s 50 percent equity in the property. The superannuated building super also told me that the partners had recently changed realty companies in their search to fund a buyer. 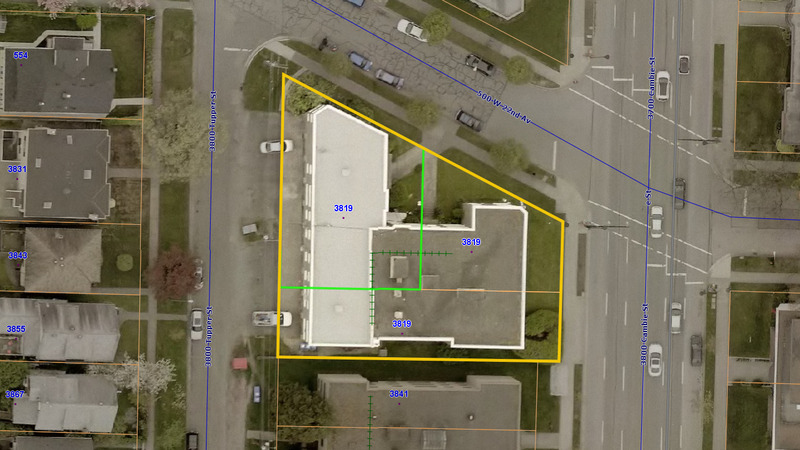 This explains why there are search result traces for many deleted MLS listings for the sale of 3819 Cambie street, dating from July of 2016 through to March of 2017 but only one currently active listing with JLL—the realty company named on the For Sale sign stuck in the front lawn of the building. There is no immediate danger of the property being knocked down for redevelopment says the ex-caretaker. In his opinion, the Elaine and its many neighbouring postwar walk-ups have at least four or five years to go yet. Among other things, B.C. painter Emily Carr died March 2nd in Victoria at age 73; the freighter Greenhill Park exploded in Vancouver Harbour on March 6; beer froth in B.C. beer parlors was legally limited to half-an-inch, as of August 4th; the Second World War finally ended on August 14th and, on November 6th, Vancouver City Council did away with segregated swimming days at Crystal Pool for “whites, negroes, and Orientals”. Click the images to enlarge them. 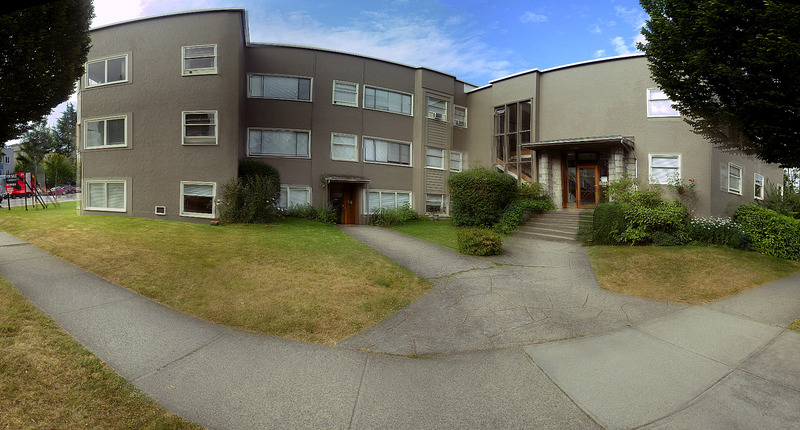 Most of the apartment buildings on this part of Cambie were built in the 1940s to house returning war vets and their families…back in the days when affordable rental housing was a viable option for families. I, too, saw the sign by the Elaine apartments and wondered what was going on. Thanks for the info.